Talking Turkey: What Could Possibly Go Wrong? It’s getting close to dinnertime, and the turkey isn’t done. Or, you simply didn’t get it into the oven on time. It happens. Solution: Spatchcock it! Spatchcocking is the act of cutting the bird down the spine, and flattening out the two sides. It’s similiar to butterflying. Once the turkey is split, it cooks in just a couple of hours. If the turkey has been in the oven for awhile and still isn’t done, try cutting it up, and putting it back in the oven. The pieces will cook much more quickly than the whole bird. As a last resort, slice it and put the slices back into the oven. The turkey should be opaque, and white or light brown in color for the dark meat. Any translucence, or pinkish color means it isn’t cooked through. So, how do I know when its done? Answer: Insert a meat thermometer into the thigh. The temperature should register 165 degrees at the deepest point. But I don’t have a thermometer! Solution: Wiggle the legs. They should move freely. If they are still tight, they aren’t cooked yet. Also, the juices should run clear. 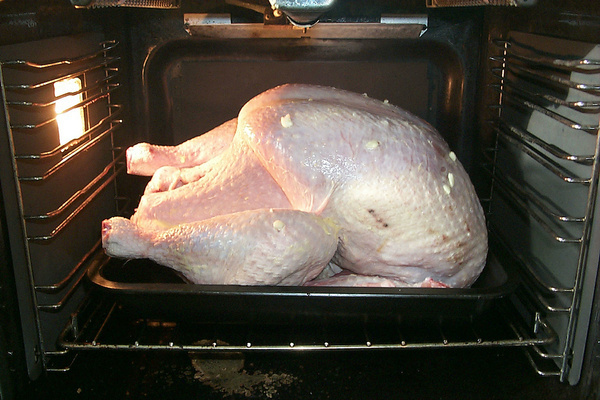 Any blood in the juices means the turkey has not reached a safe temperature to eat yet. The skin is too brown / the skin is not getting brown. Solution: If it is browning too quickly, cover it loosely with an aluminuim foil tent. If it not browning enough, crank up the heat for the last half hour or so. If cooking at 425-450 degrees doesn’t do it, try the broiler. Just be sure to rotate the chicken to get all sides nice and crispy. The turkey is ready, but everything else needs to be reheated. Tent the turkey in foil and heat up those side dishes. A big bird holds the heat for awhile before its carved. Also, speaking of carving, let it rest at least 20 minutes before slicing. It allows the juices to settle and will yield you moister meat. One last thought: There is usually a bag of turkey parts tucked inside the cavity of the bird. (It is usually the livers, neck and giblets.) Make sure to remove it before cooking the turkey. It is a rookie mistake, but one we have all done. Except you. Because now you’ve been warned. You’re welcome! This entry was posted on November 25, 2015 at 7:31 am and is filed under Food. You can follow any responses to this entry through the RSS 2.0 feed. You can leave a response, or trackback from your own site.